The classic crochet granny square motif has been reinvented again and again. Using different variations of the square itself, playing with different color combinations, and arranging squares in different ways, you can create an endless array of different granny square crochet blankets. But how do you get ideas for the right design? After all, not every color combination is going to look right. Some will be dull, and others will be garish. 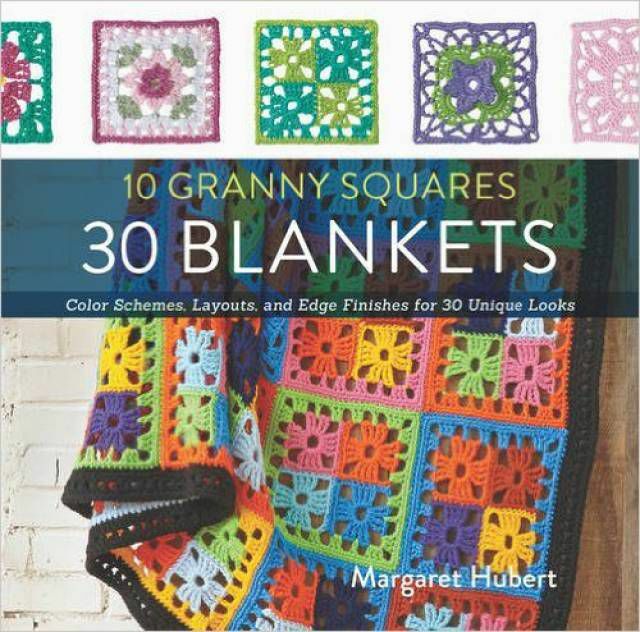 Luckily, crochet designer Margaret Hubert has the answer for you in the form of a book called 10 Granny Squares, 30 Blankets: Color Schemes, Layouts, and Edge Finishes for 30 Unique Looks. There are ten crochet granny square patterns in this book, including floral crochet granny square patterns. You will learn how to create different styles of crochet squares, each of which will display color selections in their own unique manner. There is a great range in terms of difficulty, and there are a few really unique crochet square patterns in the book. One popular choice is the Quartet, which is used to make the blanket that is featured on the cover of this crochet book. This granny square has four smaller openwork squares connected together with an edging to make a larger square. Author Margaret Hubert is the perfect crochet designer to show us crochet granny square patterns, since she's also authored The Granny Square Book and Granny Square Flowers. Light and Dark Green. Two light green and two dark green crochet squares inside of a border that's dark green on the inside and light green on the outside. The result is nature-inspired and subtle. Multi-Colored. Four squares each of different colors with a fifth color for the border that ties them all together. (This is the variation that you see on the cover of the book.) People who love really colorful crochet granny square projects will see how this works well. Blue, White, and Brown. Three blue squares, one white square, inside of a brown border. People seeking a subtle combination, perhaps for a child's nursery, will enjoy this combination. Green, Pink, Yellow, and Blue. One square in each color, with a border in blue, gives you an Easter-inspired design. The light and dark green option has a natural, organic feel. The multi-colored is both playful and contemporary. The third crochet blanket has a strong retro appeal. And the final blanket, designed for making a crochet baby blanket, has a bit of a floral feeling to it. Just the color change makes that difference. As you work with different combinations, you will see how various color combinations have different effects. If this interests you, research basic color theory to get started with your own color layout ideas. The multi-colored crochet square is worked in even more colors, 10 in total, which are then laid out in a grid of 30 squares to create the full blanket. The blanket's edging is black to make all of those many, many colors pop. One way you could change this is to make only a single multi-colored square (one square in five colors; the same design made 30 times) so it would still be colorful but not quite as intense. The 36 squares that make up the blue, white and brown crochet blanket are each made the same way, but they are laid out so that the single white squares in each larger square are facing each other in the corner to create nine white squares inside of the blanket. The border uses one of each color. Each of the 16 crochet squares in the baby blanket is identical to the others. They laid out in exactly the same way, joined together with a blue and green border that has a lot of interesting detail. So, in addition to the color changes, the way you lay out those squares and the border that you add to the final blanket can all make a huge difference in the final design of the crochet blanket. This crochet book provides a lot of ideas for different ways to play with the design. It's inspiring, colorful, beautiful and fun. Choose the type of granny square that you want to use. You can use one or more different styles of squares in the same project. Place squares in a random order or strategically lay the colors out in a certain way. Then move them around until you have a final design that you like. For example, you might create an entire row of yellow squares, then realize that you want to move one blue one into the center of that row. A hands-on approach to color design is the best way to see what you like.